Big Bird’s Drink – The Results Are In! I imagine Big Bird hanging in his nest, kicking his big orange feet up on a big twig and sharing nachos with Snuffy as he settled in along with 60 million other Americans to watch the Presidential Debates. Did he fall out of his tree when he heard his big yellow feathered head is in the crosshairs of the GOP Presidential Nominee? Was his beak agape at the news? Did his big body slump in sadness at the thought of losing his long running job? Mitt’s promise to give Big Bird the axe touched a public nerve. I’ve heard calls for a “Million Muppet March” and for a movement to “Occupy Sesame Street”. I think some Muppets might be ready to rumble. Sure this outpouring of support must warm the big bird’s heart and if I were Big Bird, I think I’d also need a heart-warming, nerve calming drink. But what would that drink be? @WarrenBobrow1 suggests a Green Swizzle (which seems like a perfectly named drink for a Muppet) and responded to a request for less sugar (@catekustanczy) with this suggestion: Chartreuse, white rum, crushed ice, mint, bitters and simple syrup. @SuburStateOfMom suggests a Dark & Stormy – pretty self-explanatory, I think. @cocktail_diva believes a Banana Daiquiri sounds like a good regular drink for Big Bird. But after watching the debate, she suggests he might want a shot of Jack. @CurranEileen suggests Sancerre by the bottle because that’s what she’d do in his shoes. (Drinking more than one bottle implied). 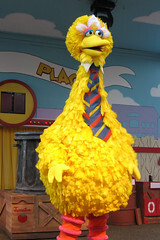 @AskBartenders says Big Bird should have a Screwdriver and the reasons are obvious: It’s yellow and he just got fired! @HOTSAAKE suggests an Aviation though on the chance Big Bird is flightless (and he is a BIG bird with small wings) maybe a Stork Club. @HOTSAAKE might be going to far with the suggestion that a clubbed stork would be a good food pairing with his drink choice. I’m pretty sure Big Bird is an animal rights guy. @marciarusso thinks Big Bird might enjoy a Lemon Drop. @SideKickSG calls for Shots, Shots, Shots! Shots make tons of sense on many levels, especially since @SideKickSG = SideKick Shot Glass. @OHIOjagergirls suggest #honeydewme. I think that’s all the Jager talking. @RachelC_fr went for it and suggests a Dirty Bird. She feels bad for suggesting that in reference to Big Bird but I feel pretty sure Big Bird has a sense of humor. And finally, @jeffomara points out that a Mocktail must be Big Bird’s cocktail of choice. Since PBS only accounts for 0.012% of the federal budget, going after Big Bird will be meaningless in terms of reducing the deficit. So a decisive action plan that zeros out PBS will have zero impact, much like a fake cocktail. I imagine Big Bird is in hiding now and all his friends (Elmo, Cookie Monster, The Count, Grover …) must all be pretty shaken. After all, if Big Bird goes down, they won’t be far behind. So if you should run across Big Bird, it might be nice to show him some love and buy him a drink. OH, I of course would buy him a margarita, frozen. They usually come in big glasses, perfect for a bird of his size, and the straw would be a good drinking accessory for someone with a beak. Thank you to all my Twitter friends for participating! Thank you to Mitt Romney for making this possible and most of all, thank you to Big Bird! If anyone has drink suggestions to add, please comment!